Your iPhone 4 is randomly loosing your sim card? 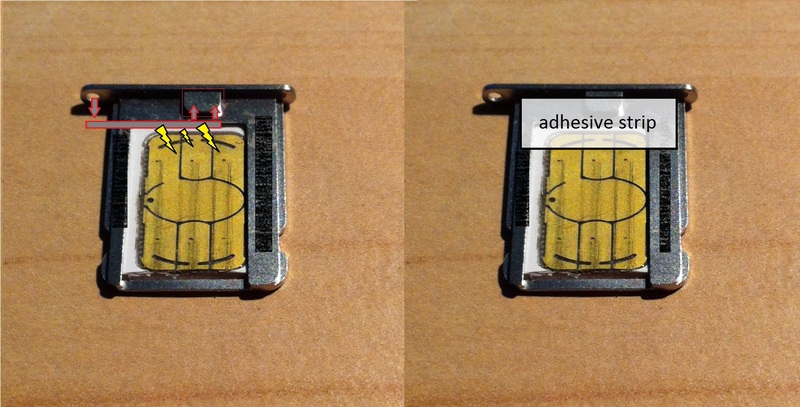 I´ve got an solution which helped me after cutting my normal sim to an micro sim. But this solution doesn´t require a cutted out micro sim. It can also occur with an original micro sim. But if you did, you should first make sure that you didn´t damaged the chip on the sim card! The problem is, that the opening mechanism is sometimes causing a short with the contacts of the sim (left picture). To prevent this, I put some adhesive tape on the top of the sim tray (right picture). After that no more „No Sim Card installed“ message! Feel free to comment!